" Charles Byrne,Gent. arrived from Ballinakill, near Clonmore, in the Co. Carlow about the year 1705 and married Mrs Kitchen, of Sleaty, a widow by whom he got the property of Sleaty, now would be worth about £3000 per Annum, authority J. O' Meara. They had one son, Gerald Byrne, Esq." Shearman quotes " 4. Charles Byrne " to be the eldest son "3. Edmond mac Hugh Gangagh O'Birn of Ballinakill,Clonmore." 3. Memorial Stone of Charles Byrne of Sleaty. 's The memorial stoneof Charles was unearthed by Eddie McDonald and Val Byrne in 1992. The stone, which was completely covered ove,r was in the old Graveyard in Clonmore. The stone had been badly mutilated probably by United Irishmen rebels in June 1798 retreating from the Battle of Hacketstown when they also burnt the Protestant Chapel , subsequently rebuilt across the road from the Old Graveyard. Charles who had embraced the ' established ' religion and took part in the previous massacre in the Battle of Carlow, 25th May 1798 would not have endeared himself to the rebels. 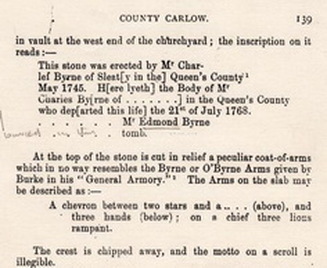 According to Ryan's History of Carlow the Vault of his father and family was also mutilated. Archaeological Society of the County of Kildare. There is no record of the Arms being registered with the Chief Herald's office.